A visit to the Tamang Heritage Trail takes you to some of the most superb trekking in Nepal. 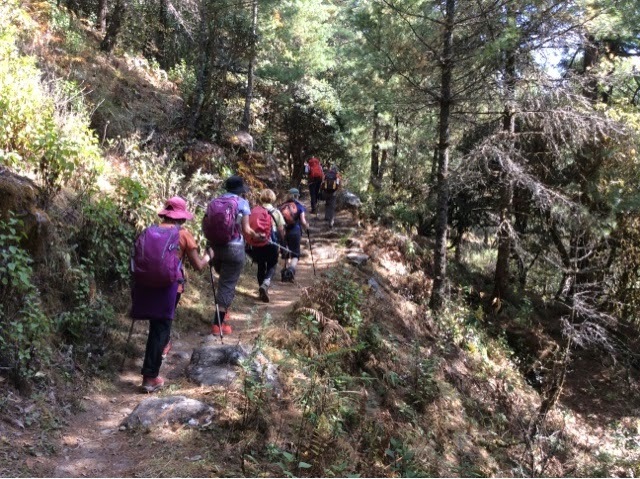 Lying just north of the Kathmandu Valley, the Tamang Heritage Trail is perhaps the most accessible trekking region in Nepal, where you can experience some of the most beautiful scenery in the country and trek through unspoiled Tamang villages while providing a sustainable economic benefit to the community. We began our trek from Gatland descending through farmland to the river, then it was a steep climb in very hot conditions to our lunch place at Gong Gang. Onwards and upwards we climbed, the girls found it interesting how the local people live in such harsh conditions, and were amazed that we had access to electricity, especially Linda who un be kowns to me smuggled a hair dryer into her kit bag. Linda definitely kept the locals, and odd tourist entertained when drying her hair in lodge one evening. Having a hot shower each night if required was another unexpected luxury, and a cold beer went down after a long hard days hike. Trekking in a more remote area has its pluses, as we were not bothered by the children asking for balloons and sweets, the children in these villages were just happy to greet us with a big smile on their gruby faces. We were also pleased that we were off the local tourist trail, which is usually clogged with a cocktail of nationalities, and crowded lodges, where you have to wait hours for a meal. Most of our food was prepared by the owner of our lodge who was assisted by our guide TB and Sherpa Dil, they are both fantastic cooks who look out for our wellbeing, both with food and trekking. After 5 days we reached Thulo Syabru and tomorrow is our rest day which we are all looking forward to washing clothes - as if! We hit the tourist trail to Langtang after 2 hours of descending from our lodge at Sherpa village. It was a big surprise to the girls to see so many tourists on the trail, and more amazing to find a German bakery at our lunch spot, we were not tempted as we all enjoyed the local fresh meal of Daal Bhat. 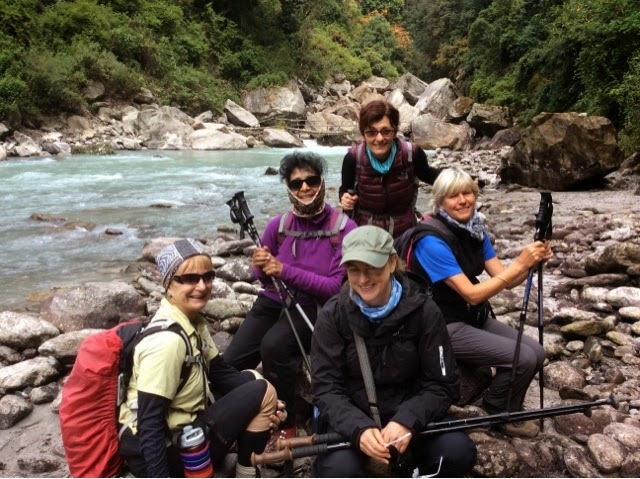 After all of my 20 plus years trekking in Nepal it never ceases to amaze me that always after lunch we have a big ascent, I guess it is one way to use up our energy food, but wow can you feel the extra weight in your belly. We reached the tea shop in record time of 1 hour, then it was a long traverse through forest, where we spotted langur monkeys. 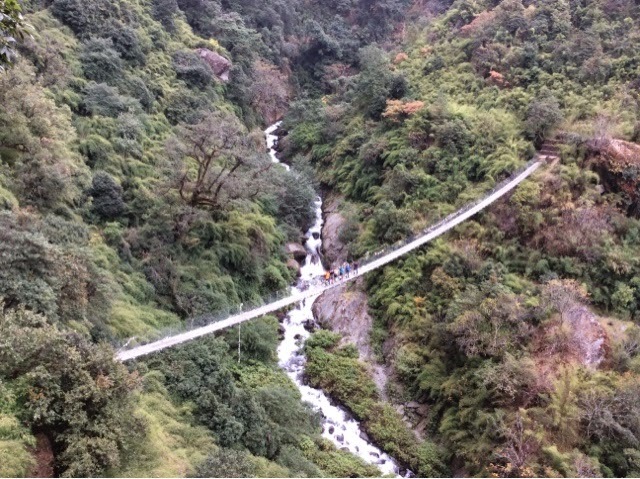 Descending yet again to a suspension bridge crossing the deep gorge. Climbing slowly we arrived at yet another tea shop this time selling local craft of woven bads, belts, table runners, knitted booties, gloves, and scarves. Purchases all round. 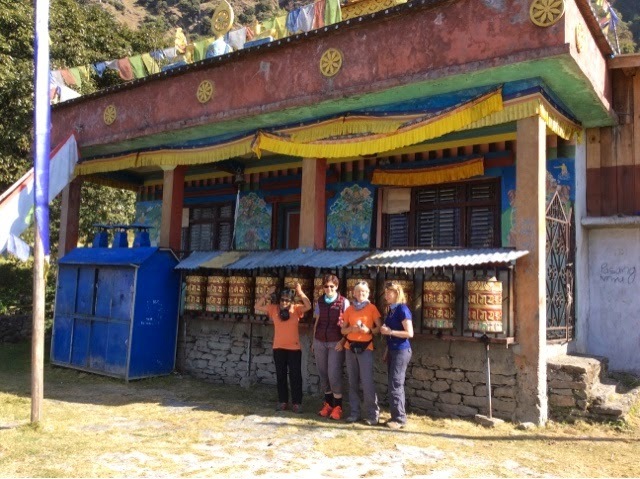 I had to stop the girls and remind them that the extra weight in their kit bags are carried by our wonderful strong porters, Dal, Jedda and Sujan. Our final climb for the day we arrived at Thulo Syabru which is quite a large village situated on a ridge at 2450 mtrs. Our hotel for the next 2 nights has attached bathrooms. Which means nothing, as the shower is solar heated, and at this time of the year the sun is not strong enough to provide hot water, but wait, we have another bathroom with a gas heater so all is not lost. The morning of our rest day we enjoyed the luxury of sleeping until 730, the boys bought us bed tea, 9 am breakfast on the rooftop of our hotel in the sun. We were all tempted to stay there and relax, but we had chores. The first was the washing, so we were all given a bowl and walked down to the local washing tap where we were reluctant to put our hands in the icy cold water. Next was a walk around the village, and a visit to the local medical centre to purchase a few emergency drugs, panadol, de cold, antibiotics, hopefully we will not have to use. After a delicious lunch of Daal Bhat, pickle, beer and fresh fruit which we bought from Kathmandu we settled down to a siesta in the sun with magnificent views of the surrounding snow capped mountains. Tomorrow we begin our climb towards Gosenkunda Lakes and altitude, the girls are strong and I have faith that we will all get over the pass, thankfully there has not been any recent snow falls so I am not expecting us to be trekking in snow and ice, of course unless the weather changes. Have checked the weather map and all looks good for the following week. After today there will not be any wifi until we reach Kathmandu on the 25th November, when I will post an update.